DUBBED the “mother of all elections”, the 14th general election is set to dominate headlines as the date of Parliament’s dissolution draws closer. Asia’s longest serving leader, Tun Dr Mahathir Mohamad, has returned to the political fray, joining hands with his former deputy turned-nemesis-turned-ally, Datuk Seri Anwar Ibrahim, to take on his former protégé-turned-adversary Datuk Seri Najib Razak — the current prime minister. The stage is set for what is expected to be an all-out battle, with Mahathir, 92 — with five consecutive election victories under his belt as former Barisan Nasional chairman — going against Najib — the eldest son of Mahathir’s mentor, Tun Abdul Razak Hussein, the second prime minister. Will BN manage to regain a two-thirds majority or will the opposition score an unprecedented win? The Edge looks at some of the potential outcomes and market responses. With most fund managers and analysts pricing in a simple-majority victory for Barisan Nasional in the 14th general election (GE14), the stock market is expected to experience a relief rally if the prediction comes true. In GE13 when BN retained power with 133 seats out of 222 seats despite losing the popular vote, the stock market rebounded positively post-election. The market had been relatively flat prior to polling day as the election outcome was uncertain owing to expectations that the ruling coalition could lose amid the opposition’s rallying cries of “Ubah” and “Ini Kalilah”. On the last trading day before the polls, the FBM KLCI only edged up 0.56% to 1,694.77 points. However, the day after the election results were announced, the benchmark index jumped 3.4% and continued to rally until the year end, gaining a tenth to close 2013 at 1,866.96 points. UOB Asset Management (M) Bhd chief investment officer Francis Eng Tuck Meng says the historical evidence suggests the market tends to be relatively flat in the lead-up to a general election but rebounds on average after election uncertainties are removed. “Under this scenario, it suggests positive returns post-election,” he says. Saturna Sdn Bhd group president Monem A Salam concurs. He says the continuity of government policies are better ensured when the incumbents get an extended mandate. “Markets do not like uncertainty, whether it is with regard to policy, politics or the economy. So, if the election outcome is as expected, then we should see a relief rally, which could last for about a week to four months,” he adds. A head of research who did not want to be named believes the construction and infrastructure sectors will be the biggest beneficiaries in such an event. “If you look at the construction players, they have not really been moving upwards. Part of the reason could be due to the uncertainties about the outcome of the upcoming election. If BN retains its seats, it is likely that most of the infrastructure projects will continue. We will probably see some positive movement among these players,” he says. As at March 7, the Bursa Malaysia Construction Index had fallen 5.3% year on year and was down nearly 7% year to date. 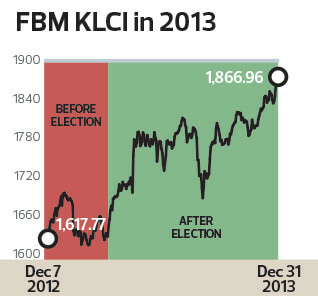 In contrast, the FBM KLCI gained 9.5% from a year ago and 2.5% year to date. A two-thirds majority win for BN would boost foreign investor confidence and is projected to translate into a strong market rally. 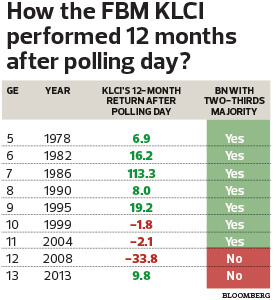 Eng says the FBM KLCI could see an even higher return should BN regain a two-thirds majority — a majority it had commanded until GE12 in 2008. “The uncertainty only became more pronounced recently. If you look at historical data, the FBM KLCI performed better in the 12 months post-election in five of seven general elections prior to 2008,” says a local fund manager. The election risk was heightened after BN, led by the then prime minister Tun Abdullah Ahmad Badawi, lost its traditional two-thirds majority in 2008, he says. Ironically, Abdullah had led the ruling coalition to a landslide victory in the preceding polls in 2004. “Of course, when it was under [Tun] Dr Mahathir [Mohamad], there was some political risk during the Reformasi period, but it was only a temporary blip, unlike what we are seeing today. So, if BN regains the two-thirds majority, it will definitely reduce the political risk and boost foreign investor confidence,” says the fund manager. Monem concurs that a stronger mandate will underscore the people’s confidence in the administration as they will be clear on its policies and direction. “This will be good for stability and it eliminates the risk of uncertainty. We should see a slightly stronger rally right after the election,” he says. Apex Investment Services Bhd managing director Clement Chew opines that market weakness in the weeks ahead could provide investors with a buying opportunity if the election is projected to be held in late April or May. “The market is likely to trend upwards when this uncertainty is removed,” he says. As in scenario 1, construction players are expected to benefit from the continuation of government policy and further infrastructure spending. Banks, utilities, construction companies and selective small and mid-cap stocks could see an increase in buying interest. In the event of a hung parliament where both BN and the opposition coalition Pakatan Harapan fail to obtain an outright mandate to assume control of the government, investors could trigger a heavy selldown as they pull money out of the market to wait out the uncertainties. This will be the worst possible outcome for investors, Chew says. “The market abhors uncertainty. A hung parliament creates a leadership vacuum and time will be needed to resolve this. The implementation of projects and decision-making may take a back seat. This will affect the earnings of some companies,” he says. Eng also expects the knee-jerk reaction to a hung parliament to be negative. “Investors will be concerned about politicking and whether it could affect the government’s effectiveness in terms of policies and getting things done. Negative sentiment could be protracted, depending on the government’s effectiveness under this scenario,” he says. A case in point is GE12 in 2008. 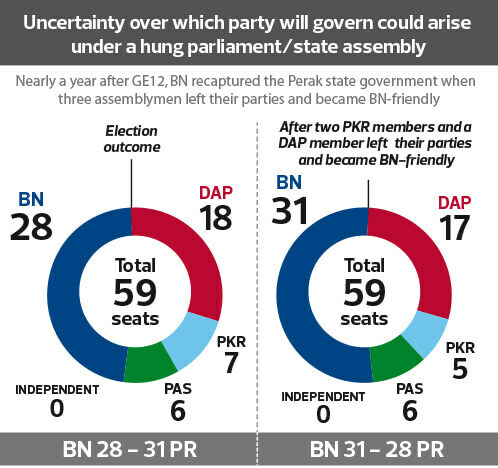 BN lost Perak when it captured 28 seats to the opposition’s 31 seats. The then opposition Pakatan Rakyat comprised the Democratic Action Party (DAP), Parti Keadilan Rakyat (PKR) and Parti Islam Se-Malaysia (PAS). After 11 months in power, Pakatan Rakyat saw the balance of power tip in BN’s favour following the defection of four of its assemblymen. Investors fear similar defections in a hung parliament could result in a change in Putrajaya. While it is difficult to predict how long the uncertainty in the stock market would last, Monem expects it to be very volatile. However, regardless of which coalition wins, he is long-term positive on the local stock market. “The government can derail but in the long run, the Malaysian economy and stock market will be fine,” he says. Monem also believes Malaysia is a healthy democracy and that laws are in place to ensure continuity of government regardless of who wins. As such, he suggests that investors with a long-term view buy on market weakness. A shocking victory by Pakatan Harapan (PH) will put Malaysia in uncharted territory as BN has ruled since independence. A head of research says the risk of a less-than-smooth transition of power could rattle the market. Recall that in 1969 when the Alliance Party (before BN was formed) lost its majority in Perak, Selangor and Penang in addition to Kelantan, riots broke out. Known as the May 13 Incident, it resulted in a state of emergency or darurat being declared by the Yang di-Pertuan Agong and the suspension of parliament. The National Operations Council was then established as a caretaker government to temporarily govern the country. Such an incident is unlikely to recur given the independence of the security forces and strong civil servant framework. Bursa Malaysia said records for the Straits Times Industrial Index’s performance following the riots were not available. The index was the benchmark indicator then for the joint Malaysian-Singapore stock markets until post-1973. In his book Stock Market Investment in Malaysia and Singapore, Dr Neoh Soon Kean, founder and executive chairman of investment consulting and publication firm Dynaquest Sdn Bhd, states that the Straits Times Industrial Index plunged nearly a fourth to a low of 130 in late 1970 from 170 in April 1969. 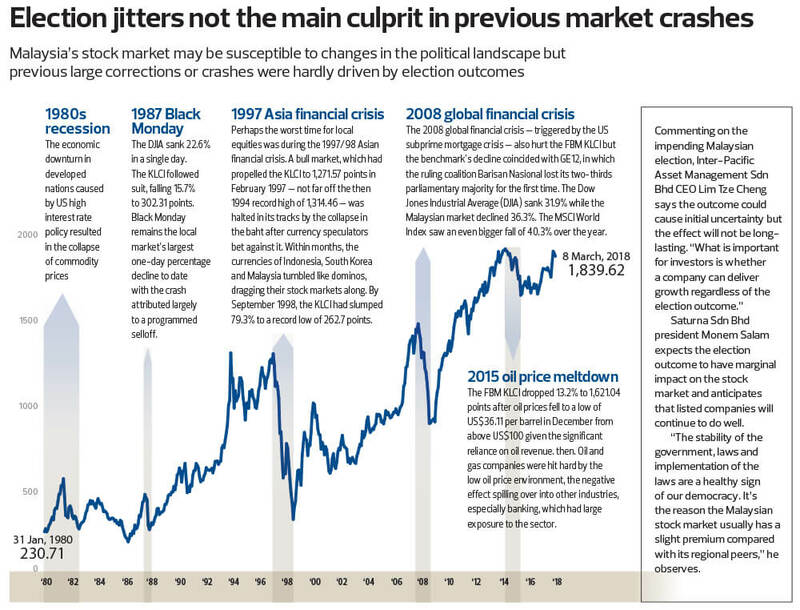 In 2008, when BN lost Penang, Selangor, Kedah and Perak while Kelantan remained with the opposition, the share market tanked in line with global markets caught in the financial crisis at the time. However, the Dow Jones Industrial Average’s 31.9% decline was surpassed by the KLCI’s 36.3% plunge. “If BN were to lose control of the government, the market will tank as investors would price in the worst-case scenario. The risks from the 1MDB (1Malaysia Development Bhd) investigation would resurface as the market would need to look at the probability of a full-blown probe into the issues, as promised by Dr Mahathir in PH’s election manifesto,” says a market observer. He points out that a new leadership would entail profound changes, including government policies, priorities, projects and people in charge.